On first entering the Montreal Montreal Museum of Fine Arts’ exhibition ‘Warhol Mania’ I was struck by the appearance of creases and frayed corners on many of the works – incongruously intimate details in the museum’s austere interior. One can easily forget that Andy Warhol not only made art about mass consumption, he made art for mass consumption as well. ‘Warhol Mania’ is a different kind of Warhol exhibition: it is a comprehensive collection of what could be described as ‘popular artefacts’ by the foremost American Pop artist, including posters made for limited and wider distribution, album inserts, magazine illustrations, and other cultural ephemera. The exhibition aims to highlight how Warhol ‘broke down boundaries between the graphic and the fine arts by using both to their mutual benefit’. It does this well. The display comprises loaned works from the collection of art historian Paul Maréchal, and covers work from Warhol’s early career as an illustrator, as well as commissions made at the height of his fame. The exhibition wades boldly into the murky waters where art and design, advertisement and expression run together. At times it feels disorientatingly self-reflexive: everyday objects ‘repatriated’ to the world of High Art, collected, preserved, and carefully curated in this context because they were originally intended for mass consumption. There’s something disarming about seeing traces of casual handling on pieces like the TIME magazine cover of 19 March 1984, featuring Michael Jackson. The exhibition describes the Thriller-era portrait as being Warhol’s ‘most widely distributed, commissioned work’ because it was reproduced and sold millions of times. Through an agreement with TIME magazine, the Smithsonian National Portrait Gallery acquired what might be described as the ‘original’ work in 1984. As the exhibition points out however, over 90% of the ‘originals’ Warhol produced for magazines were never returned, and indeed were destroyed as the magazine itself was considered the finished item. These artworks – ‘original’ or otherwise – come with coffee stains or tatty edges, but they are in no way reduced for that: indeed, some of the works that were intended for wider distribution are among the most striking. 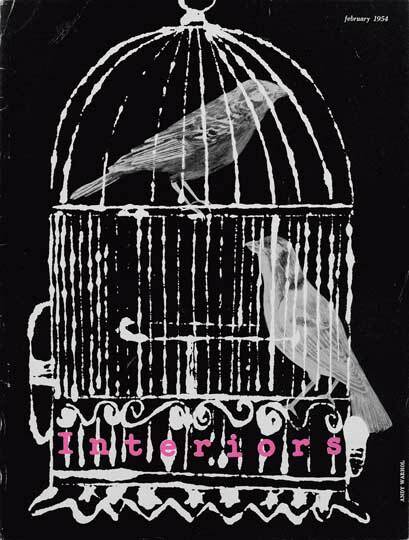 A 1954 Interiors magazine cover depicting two birds in a cage, rendered in a delicate black and white collage of photography and blotted line drawing is an early standout – visually compelling, witty and poignant. 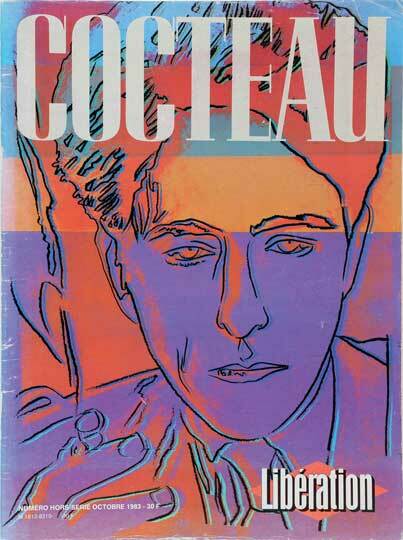 A 1983 cover of Libération features an arresting freehand portrait of Jean Cocteau. The frenetic palette of reds, mauves and oranges suffuse Cocteau’s contemplative expression – cigarette in hand – with charged energy. Examining the significance of posters in Warhol’s career, the exhibition describes how he revived the late 19th-century French tradition begun by Jules Chéret and Toulouse-Lautrec. 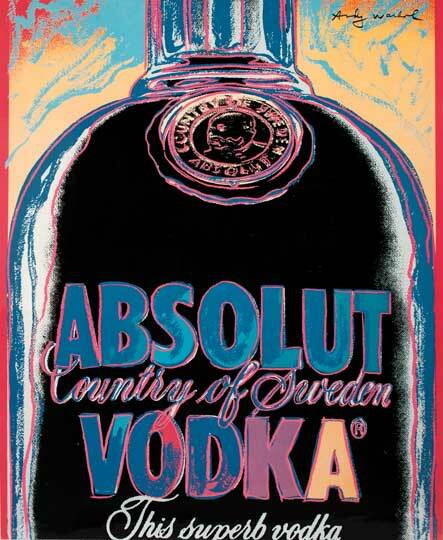 Spanning commissions Warhol received from 1964 onwards, the posters on display include the seminal Absolut Vodka poster designed for Carillon Importers, when the Swedish vodka was first introduced to the American market. Conceived of as a ‘reward’ that could be displayed by bar owners with the best Absolut sales, Warhol encouraged Carillon to commission other artists to produce ‘portraits’ of the bottle – 350 different versions have been produced since Warhol’s 1985 poster first came out. Works such as the Absolut poster, and the 1984 Cuvaison Napa Valley Merlot poster and label – pieces designed with a certain exclusivity in mind – are the exception in this exhibition. While rarer and better kept, somehow they don’t resound the way some of the works for a truly mass market do. To see a Warhol on your newsstand must have been quite a thing. His technical virtuosity and clever wit is apparent throughout the exhibition, but ultimately it is his cultural insight and empathy that make some of the most widely available works seem to be the most precious. ‘Warhol Mania: A Brand-new Look at His Advertising Posters and Magazine Illustrations’ is at the Montreal Museum of Fine Arts until 15 March 2015. Thank you for your article about the Warhol exhibition at the Montreal Museum of Fine Arts. You really understand what the collection I have been building for almost 20 yeats is all about! BTW the exhibition is extended until June 15, a sign of how positively the public responded to the exhibition.